Skype Meetings App and Skype for Business Web App automatically detect and select the most compatible video device for your meeting. You can also change the default video device for meetings. If you want to change your video device, go to More options > Meeting Options > Video device, and select the device you want. You can also save your video device preference for future meetings by clicking Yes in the Save Your Name and Settings box when you close a meeting. 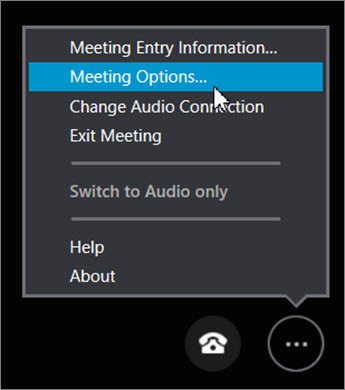 To change your video device selection during the current meeting, click the telephone in the lower right of the meeting screen, and then click Devices to choose your device. Go to More options > Meeting options. (Optional) If you want to save your preferred device for future meetings, on the General tab, make sure the Remember me on this computer box is checked. On the Video tab, click or tap the current device to see other available devices. Choose the one you want and select OK.